Composting China next big eco-friendly trend? The future of green cuisine is planting your plates. That’s the vision of eco-entrepreneur Alex Casewa, who believes composting china is the next big trend. The 25-year-old Victoria resident is the creator of Earthen eco-friendly dinnerware, made from dried palm leaves from India’s areca or betel nut tree. Each plate, bowl and tray has a unique patina, but they’re cheap and meant to be chucked. Just not into landfills. They’re designed to be mulched in back-yard gardens and have met with the Victoria Compost Education Centre’s seal of approval. No chemicals are used, so leaves compost naturally and add to soil quality. “You don’t have to send it for recycling, it’s compostable, it’s natural. Plastic is made from petroleum, which is non-renewable; we’re really using a renewable resource,” Casewa said yesterday. His business model is also a model of international development: He turns waste from betel-nut cash crops into income for farmers and employs 70 villagers making plates. The New Delhi native moved to Canada in 2004 to pursue a business degree from Vancouver Island University. The Earthen plates were a sustainable development thesis project. He launched the products six months ago. They’re now available in a dozen Victoria stores. Casewa is among dozens of exhibitors showcasing new ideas at the Grocery Showcase West in Vancouver, where green is high on the grocery list. Other innovative cookware coming to a table near you: Richmond’s FST Packaging’s biodegradable bamboo containers and U.S. company Solo’s line of plates and cups made from sugarcane stalks. In previous recessions, consumers tended to abandon pricey eco-products, said Canadian Federation of Independent Grocers president John Scott. But as green products have become more integral to our lifestyles and environmental education has increased, they are seen as less of a luxury. Now, they understand the environment and want to do their part.” Scott said grocers are doing better than other sectors because “people are moving away from restaurants and learning to cook again.” The Canadian Federation of Independent Grocers’ 20th Annual Grocery Showcase West ends today at the Vancouver Convention and Exhibition Centre. Now that you have your organic beverages and barbecue fare all lined for your Canada Day gathering, one niggling issue needs addressing: paper, plastic or papyrus? While the last may seem a little farfetched, a trip to your neighbourhood grocery store, let alone an eco-oriented mega destination like Whole Foods, will demonstrate that there is no shortage of disposable party paraphernalia catering to the conscientious consumer. From paper plates made with recycled-content to a growing array of cleverly conceived alternatives, including edible tableware, finding a platter that best accommodates your palate is becoming increasingly easier. Now while there is something rather eco-disconcerting about the garbage created in using tossaway dinnerware, sometimes the BYOD system (bring your own dishware) or funky thrift store finds just aren’t suitable. When they aren’t, consider the following appetizer-sized review of plates (with a nod to other utensils) before dishing up your next do. Like the potluck dishes that we pile on them, and endeavour to finish before they begin to warp and sag, paper plates have long been a staple for gatherings large and small, informal and elaborate. Pros: Light, convenient and reasonably priced, these tree-based products come from a renewable resource and readily degrade under most conditions. Cons: While paper platters now come in forest-friendly varieties, many of which also eschew the use of nasty and harsh chemicals, be aware that not all recycled-content versions are created equal. Most of the recycled paper plates on the market today are made with post-industrial (think sawdust from logging operations), rather than the more desirable post-consumer (what we put out to the curb) paper waste. What to look for: Avoid virgin materials, seek out products with at least 30 per cent postconsumer content and keep a big tree in mind to remind you to use them sparingly. Not even a vacation on an isolated, deserted island will spare you contact with the pervasive and disturbingly persistent creature known as the plastic polymer. Taking many shapes and forms, some more manageable (i.e. recyclable) than others, plastic is a favourite with those looking for something a bit sturdier, and immune to the moisture malaise that compromises paper plates. Pros: Like their paper counterparts, disposable plastic dishes and cutlery are generally light, convenient and reasonably priced. Water friendly, plastic has the added benefit of multiple uses, as it can be (hand) washed and reused several times. Recent evolutions, in the way of compostable, vegetable-based (corn, potato, sugarcane) options, are making the species even more attractive because, unlike earlier generations, these new ones break down into carbon dioxide, water and biomass when properly discarded. Cons: Most of the species are petroleum-based, possessing unnaturally long lives that endanger both humans and the environment during all stages of their development. While compostable bioplastics are an improvement, those such as corn plastic give rise to whole host of other issues, such as the appropriation of food resources. What to look for: While most plastic plates are pretty pesky, if you are determined to take some home, opt first for bio-based versions, most of which can be composted (commercially or in the backyard), or at least will eventually break down in a landfill. If a vegetable variety is not a financial option (being slightly more expensive), or even available, choose a product that can be recycled readily in your curbside blue box. Sugarcane (or bagasse) based plates can be found at a variety of health food stores. “Too pretty to throw away” is how many people describe the growing number of disposable products made from such materials as bamboo or discarded palm leaves. While often sold and recommended for single use, their visual appeal often inspires people to keep them around for as long as possible. Pros: A mix of the best qualities of paper and plastic — sturdy, reusable, readily biodegradable or compostable and sourced from renewable resources — plates made from materials like bamboo and pressed palm leaves are attractive both environmentally and esthetically. Cons: More expensive, sometimes significantly so, than your average disposable paper or plastic plate. What to look for: Whenever possible, choose products that indicate they were sustainably grown (i.e. no pesticides) and harvested, and used no chemicals in their production. 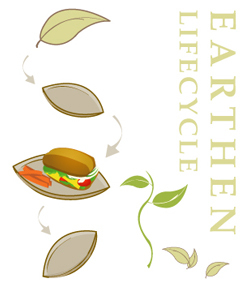 For those looking to support local, consider Earthen Disposable Dinnerware. The company was started by Victoria-based Alex Casewa, who came up with the idea as part of his sustainable-development thesis project. Kim Davis is a Vancouver environmental affairs consultant. Made of naturally tan-coloured pressed palm leaves, Earthen Disposable Dinnerware plates look straight off the set of Gilligan’s Island. Not only do they add style to a picnic, they’re biodegradable, unbleached, and compostable, besides being strong. Malaspina University – College business-school grad Alex Casewa came up with the idea for a class project. Originally from India, he knew that fallen palm leaves were going to waste, and put the resource to good use with these plates. You can find them at MarketPlace IGA stores, where 12 plates measuring 22 centimeters in diameter go for $6.99. From paper plates made with recycled-content to a growing array of cleverly conceived alternates, including edible tableware, finding a platter that best accommodates your palate is becoming increasingly easier. What to look for: Avoid virgin materials, seek out products with at least 30-per-cent postconsumer content and keep a big tree in mind to remind you to use them sparingly. PROS: Like their paper counterparts, disposable plastic dishes and cutlery are generally light, convenient and reasonably priced. Water friendly, plastic has the added benefit of multiple uses, as it can be (hand) washed and reused several or more times. Recent evolutions, in the way of compostable, vegetable-based (corn, potato, sugarcane) options, are making the species even more attractive for unlike earlier generations, these new ones break down into carbon dioxide, water and biomass when properly discarded. If a vegetable variety is not a financial option (being slightly more expensive), or even available, choose a product that can be recycled readily in your curbside blue box. Sugarcane (or bagasse) based plates can be found at a variety of health food stores. At Whole Foods Market, 15 plates measuring 25 centimetres (10 inches) in diameter go for $4.69. ‘Too pretty to throw away’ is how many people describe the growing number of disposable products made from such materials as bamboo or discarded palm leaves. While often sold and recommended for single use, their visual appeal often inspires people to keep them around for as long as possible. The company was started by Victoria-based Alex Casewa who came up with the idea as part of his sustainable development thesis project. You can buy Earthen’s innovative products at MarketPlace IGA stores, where 12 plates measuring 22 centimetres (9 inches) in diameter go for $6.99, or at earthentrading.ca on the Internet. Alex (Mrinal) Casewa developed a new business idea while completing his degree at VIU. 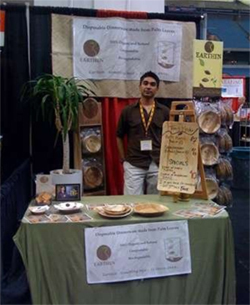 He now imports and sells a product called Earthens, bio-­‐degradable dinnerware made from fallen palm leaves from India. Meet Alex (Mrinal) Casewa. He represents a new breed of business leaders. A recent graduate of Vancouver Island University’s Bachelor of Business Administration program (BBA) Casewa is making a name for himself importing and selling a new biodegradable product called Earthens. The environmentally friendly product consists of dinner plates and bowls of various sizes made with fallen palm leaves from India. So far, Casewa said the product is available on store shelves in Victoria and on the mainland. Casewa will share his story with new BBA students at a special day-long orientation session next Wednesday, Sept. 2 called Jump Start. Instructor Duane Weaver said Casewa is a good example of the success students can have immediately after graduating. Casewa wants to tell new students that “anything is possible” if they work hard at their studies. He developed the initial concept for Earthens while completing his degree. After graduating, Casewa continued learning how to set up a corporation, how tax laws work and related food safety/environmental regulations. In 2008, his first container of product was shipped to Canada. To find out more about VIU’s BBA program and other courses offered in the Business faculty, visit the website at http://viu.ca/business. Let’s face it – no one loves the idea of buying, using and disposing of paper plates and plastic cutlery etc., but when it’s your turn to host the family BBQ or when you’ve volunteered to pick up supplies for an event at your school – it really becomes a necessity. The good news is there’s a growing supply of more environmentally friendly choices for disposable tableware that are not made from virgin fibre paper, plastic or the hardest to decompose… Styrofoam! Some great new options out there include bagasse (sugarcane) and PLA (plant based) and reed pulp ~ all very good choices for those such occasions where disposable tableware is needed. these plates and bowls are the strongest and most heat tolerant ‘disposable plates / bowls’ we’ve ever seen – If you are serving something heavy, or quite hot, do doubt you’ll find another disposable product that would come close to this performance. 100% biodegradable and compostable. Once composted or decomposed, this material provides essential nutrients to the soil. If you’re on the hook for hosting a party or event where using and washing your own everyday dishes is not a reasonable option, consider Earthenware palm leaf plates, or sugarcane bagasse ~ simple ways to make choices that are so much easier on the environment than traditional disposable products. You can visit www.greenplanetparties.com for ‘greener’ tableware and party supplies where we are proud to offer the new Earthens products.